Open letter to the Parliament of Curacao regarding the recently proposed rezoning of Oostpunt to members of the same Parliament. The Dutch version can be found by clicking here, the Papiamentu version can be found here. A letter with similar, but slightly more detailed information as also send to the Governor of Curacao. Click here to see the letter to the Governor. Carmabi has produced various informative documents to inform Curacaoans and other interested parties about the unique nature that can be found near/ at Oostpunt, both below and above the water surface. 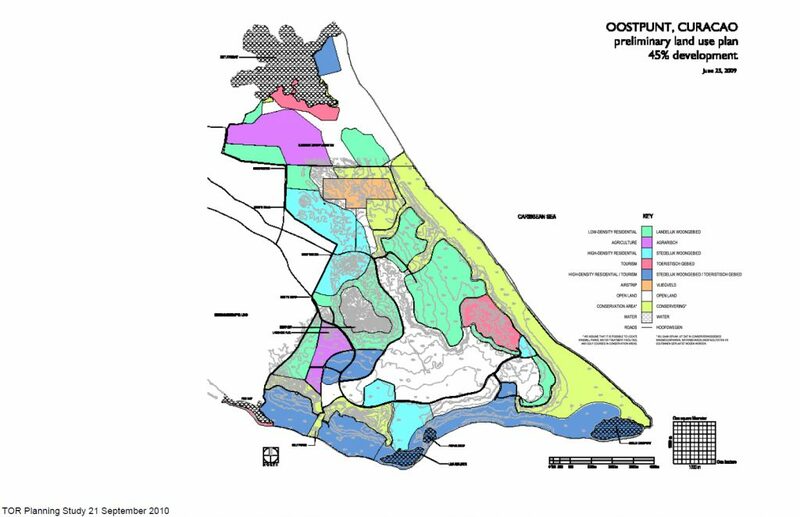 In addition, Carmabi has produced various documents that overview the Foundation’s concerns regarding the proposed development of Oostpunt as published on the website of the Curacaoan Government in 2012. These documents serve to share existing concerns, to promote constructive dialogue and inform stakeholder groups on many important aspects that have not been addressed in the study investigating the extend to which Oostpunt can be developed that was made available in 2012 through the Government’s website. 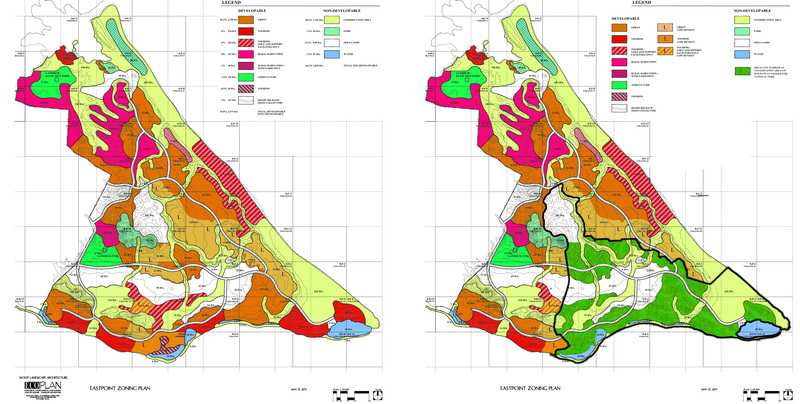 We also like to stress that Carmabi does not oppose sustainable and “smart” development of the Oostpunt area, we simply believe that the proposed plans are ill informed and unnecessarily contribute to the loss of unique ecosystems that make Curacao stand out positively in the Caribbean region. Carmabi would also like to clarify that it has no desire whatsoever to develop anything or start activities of any kind at Oostpunt despite often heard suggestions in that direction. NEW [July 12, 2017] How did the map with a proposed conservation area came about? In this map, conservation areas are included (in yellow/ green), but are concentrated in the North along the rocky, wind-exposed North shore. Note that this map served as a starting point for future studies by Wolff c.s. which had to result in a definitive, better thought-out plan for Oostpunt. To include a scenario whereby the unique coral reefs would receive some form of protection, Carmabi proposed to include a park in the map above so that reefs would be protected from land-based forms of pollution following the principles of the “ridge-to-reef” concept (for more details, see here). This suggestion was then included in the map above, i.e., the map from the TOR produced by the government and the owners of Oostpunt. This resulted in the map below in which the colors of the map above were modified as well for clarity. To protect the reefs directly bordering the shore, dense forms of development were replaced by areas designated as conservation areas that could be in or outside a proposed park. Those options and possibilities thereto would have to be studied first and hence the map below, similar as the map from the TOR, simply serves as a starting point for future studies on how Oostpunt could be most effectively zoned. Again, this map is not made by Carmabi other than the suggested addition of a conservation area in the east. Whether this was realistic or fitting to the needs of the land’s owners and/ or government had to be decided by those conducting the studies outlined in the TOR. Nonetheless, many took the map above as a sign that Carmabi itself had come up with a “totally new plan” for Oostpunt, which in light of the above is obviously not the case. The map above was removed from our website when rumors about “Carmabi’s own development plans” became persistent and replaced by the orange green/orange map below which simply and only suggests the inclusion of a conservation area for consideration by Wolff c.s. The pink/red/ purple areas were removed to minimize the suggestion that these zonations were proposed by Carmabi, a remarkable suggestion as they were simply copied from the TOR map and only changed with regard to color. The main idea behind our proposal for an alternative development scenario is thus shown below. 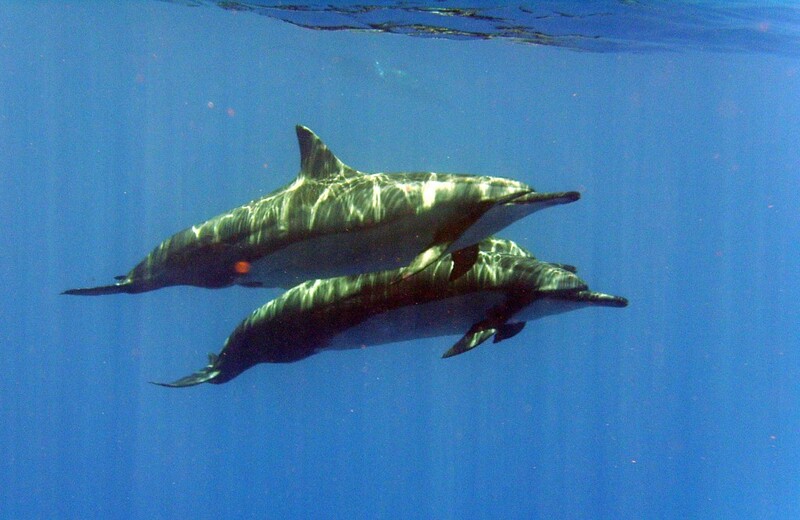 It would allow for the protection of Curacao’s (and the Caribbean for that matter) best and most important coral reefs. Protecting some of the adjacent land is needed to protect the watershed associated with this area based on the well-known “ridge to reef concept”, which is used worldwide to protect coastal reef systems. Click here for more information on this concept. 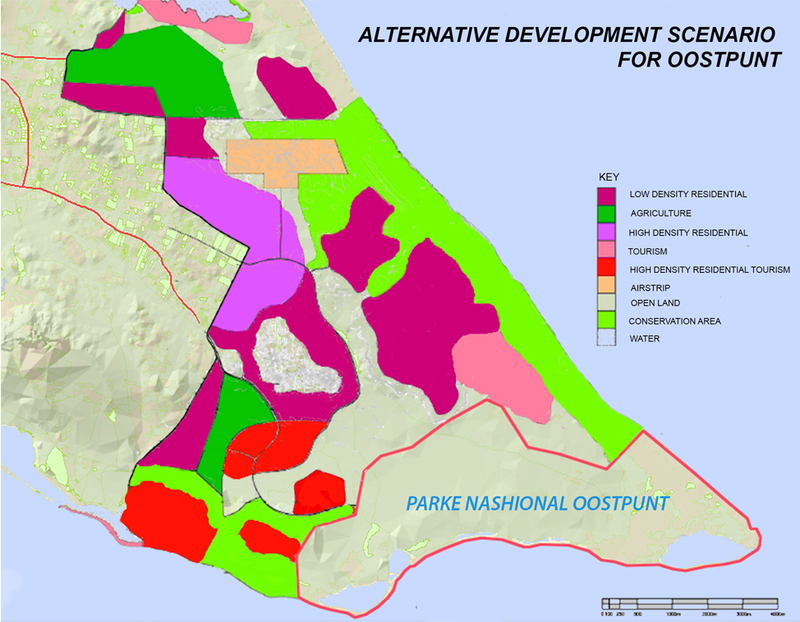 The remainder of Oostpunt (i.e., the area in orange) could then be used for smart development to accommodate the island’s needs. When one would combine the concept shown above with the proposed development scenario’s produced by Wolff c.s. 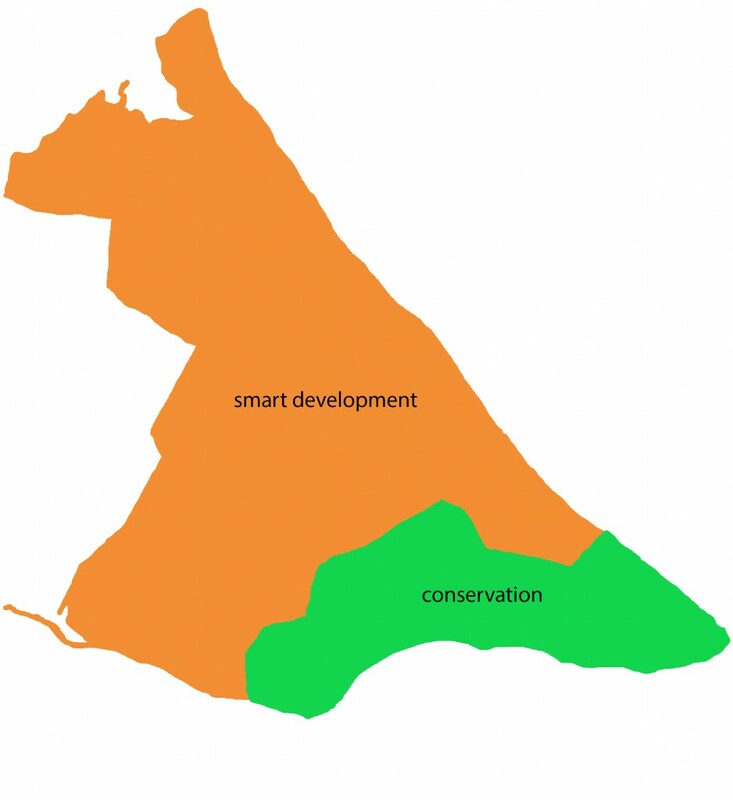 (for the orange part only), one would obtain a combination plan in which both development and conservation are possible. Combining the Wolff plan with the map above following the principles of the ridge-to-reef concept would result approximately in a map shown below. Note that the proposed conservation zone then becomes slightly larger (but almost entirely consists of areas where no development would take place anyway (areas in white and light green) following the zoning plan proposed by Wolff) as it now stretches to the top of hills present in the area following the ridge-to-reef principles. Again, this is merely to illustrate the possibility of combining conservation and development scenarios and what such combination would look like in general. Additional studies would have to be conducted to produce a final “combination scenario”, but at least this scenario strives to accommodate known needs of developers and concerns of societal groups. To make sure: this plan only adds a national park to the plans proposed so far and the developments are similar to the development scenario proposed by Wolff c.s. resulting in relative small modifications (on the right) compared to the proposed plans of Wolff (left) as illustrated by the pictures below. Chapter from “De Vastgoed fraude” (i.e., the biggest real-estate scam in the Netherlands) describing the connection between parties involved in the planning process of Oostpunt and Dutch real estate criminals (in Dutch) Click here. Landsverordening (~ Gov’t’s decision) to appoint a committee that has to overview and discuss the concerns raised against the development plan proposed by Wolff c.s. NOTE: The findings of this committee were never communicated to anyone that commented on the proposed Oostpunt zoning plans. So despite the fact that the committee was specifically tasked to review all concerns raised, the results are till now unknown. “Beslisdocument” in which the Ministry of VVRP “responded” to all the concerns raised regarding the proposed development of Oostpunt and subsequently informed the Council of Ministers that “all was fine”…. Critical notes regarding the map provided by Minister Balborda (VVRP) to the Council of Ministers. This map was supposedly a modified version of an earlier map taking into account the concerns raised regarding the proposed zoning plan by Wolff c.s. The map appears however similar to earlier versions, i.e., does not include modifications in response to those that voiced concerns (AMIGOE 10-03-2015).